Mercedes-AMG has a motto, “One Man, One Engine” and it’s a beautiful story. Mercedes paints the picture of AMG engines being painstakingly created by engineers blending old school craftsmanship with modern power and technology. The reality of all this is that it’s more a beautifully crafted marketing story around a production process that is done by necessity. When one thinks of a hand-built engine they often envision a product coming from a small engine shop where a true master craftsman blueprints and balances the components, agonizing over every detail. Blueprinting an engine in short means absolutely every single tolerance is EXACTLY, PRECIESLY spot on within a tolerance tighter than even a thousandth of an inch. It means things like there being absolutely no deviation between lifter bores which are perfectly spaced center to center and in absolute spot on alignment to the cam lobes, etc. etc. AMG engines are good, but they are not manufactured to the tolerances of a blueprinted engine by a true craftsman, they can’t be, the costs of production would just too high. The engines are assembled by grabbing parts from bins and racks. Parts that are not measured or mated to each other. They are mass produced components and the pistons that go into one block may have been put in another if the assembler happened to reach a little bit over to the left than the right. Factory spec allows for a variation in tolerances, exquisitely crafted engines do not. All automotive engines are “hand assembled”. What AMG implies makes their engines superior is that one individual builds the entire engine from start to finish vs a production line process where the engine is touched by many hands. A AMG engine, like the production line engine, still just has its components coming from bins of parts. The final assembler, that guy whose name is on the plaque placed on top of the engine, is simply pulling parts from racks and bins and putting the engine together in nearly the same fashion as would be done on a production line. True they look over the parts they are installing but that’s also true of the MB assembly line engine production process as well. The reality here is that the quality of an assembly of a MB production line engine and an AMG hand-built engine are on par with each other and the care of the motor by the end user will be a greater determination of its longevity than which method was used to screw it all together. Mercedes reputation of longevity of its engines have nearly all been achieved by engines that were built on an assembly line. The engine assembler at AMG is not allowed to do any real “hand crafting”. He/she is just a component to be managed in the process. Bolts are all torqued by machines that the assembler lowers on to them and the engineers who program the machines set the proper torque and torque pattern, the assembler just lines things up and pushes a button. An assembler is also required to follow strict procedures on a screen, scanning each components and tool they use so the computer accompanying the engine build process makes sure the assembler doesn’t forget to complete any steps. AMG works to remove the human component as much as it possibly can but talks it up as if the human is the most important part of the engine build. In reality the assembler is semi-skilled labor. Semi-skilled labor falls in between skilled labor (lawyers, programmers, doctors, etc.) and unskilled labor (parking lot attendant, fast food worker, etc.). Semi-skilled labor is generally defined as positions that takes about 3-6 months of training to learn how to perform the job and doesn’t require an advanced degree. The biggest factor in modern engines that cause problems is the quality of engineering that goes into the design of the components, not the final assembly process. One example of a failure of engineering would be in the first fully AMG designed engine, the M156 6.2 liter engine. You know the one, you can often spot them as cars that have these have 6.3 (for “tradition” without regard to what is actually under the hood) on the fenders. These M156 engines have problems with head studs breaking, cam lifter buckets, and camshaft wear. These problems, which are analogous to issues on other various MB production line engines are never a result of the process in which the engine is assembled. The issues come with the specifications and manufacturing of the components that were dictated by engineering. So why is AMG hand assembling the engines? It has been reported in recent years that AMG hand builds around 20,000 engines a year. If we assume no one is working on the weekends in the engine shop it means they are building around 75 engines per day. That is 75 engines a day across their entire hand-built range, some being V12s, some V8s, some I4s. To construct an assembly line for this low volume production just doesn’t make fiscal sense. The costs of constructing an assembly line is enormous and they are intended to produce assemblies at high volume. If AMG did this for their V12 engine for example within a week running the line at typical production speed it would fill V12 production quota for an entire year or more. What do you do then tell all the employees working the line to go home till next year and turn the lights off in the factory? Meanwhile the millions of dollars that went into constructing the line and training employees goes unutilized. Same is true with the more common V8 AMG engines as well. It’s cheaper to have each employee be assigned the assembly of one engine and push that engine cart around to each station where they grab components, put it on the motor, then push the cart over to the next station, etc. The economies of scale just aren’t there to do it in the “typical” way. Where it does make sense for AMG to mass produce an engine using an assembly line, it does. The AMG 43 series cars, whose engines need to be produced in higher volume are production line built…and their quality will be no better or worse than “one man, one engine”. 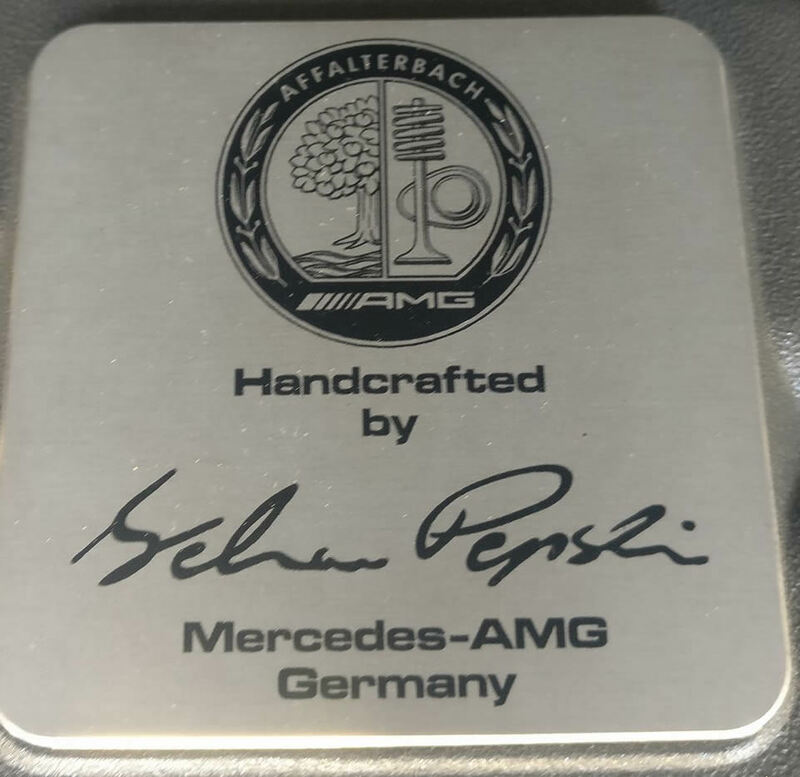 So, when you see that badge on top of an AMG engine with the signature of the individual who slapped it together realize that what it represents is a great fabrication of marketing and less of craftsmanship.